Apparently, New York Consul General Cecilia Rebong says the Le Cirque banquet story of the presidentita and her loyal band of sipsips, is false and cites a news report of the Filipino Reporter, just one of the dozens of newspapers/tabloids catering to Filipino-American communities in the United States. When asked if reports were true that the tab of the presidentita's party reached $20,000, "Wainer became furious and said it was not true." Of course, the reporter could not exact the real amount of said dinner from the manager, w/c begs the question, was he furious because the bill was too high, or too low from what was actually paid? And btw, was he referring to the first or the second dinner, bec. apparently, there were two held at said restaurant? The story doesn't really say much and in fact, may be considered a dud, by journalism standards. It really isn't a credible defense for the presidentita either. How laughable and amateurish as usual, for GMA's minions to even quote a newspaper to protect her honor! 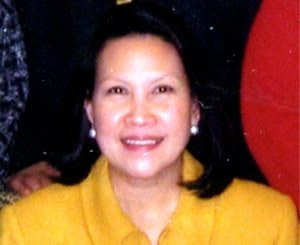 Btw, if Rebong's name sounds familiar, it's because she was the Filipino diplomat who was exposed in 2005 for leasing a two-bedroom flat in Trump World Tower for $10,000 a month. Of course, NY apartment rentals are not the cheapest in the world. But I'm pretty sure, w/ more patience and a lot more looking, Rebong could've gotten a better deal for us Filipino taxpayers who are paying her salary and that lease. (At the present conversion rate, that is P500,000 a month.) Besides, the bulk of Fil-Ams in NY do not live in Manhattan, but in Queens! With this kind of decadent lifestyle led by Rebong, I wonder if she was in the dinner party of the presidentita at Le Cirque. Hmmm...question is was it dinner 1 or dinner 2? I lived in the NY-NJ area for over twenty years and The Filipino Reporter is considered to be the "Abante" of the Filipino community. Its amazing, but not surprising, that Remonde and his cohorts criticize the New York Post as a tabloid when The Filipino Reporter fits the description even more. Mario Wainer is the maitre'd of Le Cirque Restaurant.